Mind-body wellness and fitness expert combines mantra, self-reflection, and movement into an accessible 14-day routine for manifesting your best self. Holistic wellness and fitness expert Erin Stutland harnesses all the body's mental, physical, and spiritual energy in her tri-fold approach to creating change. 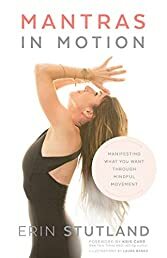 When you move your body while repeating mantras--speaking your desires aloud--manifesting is no longer a purely intellectual exercise or an occasional craft project. Instead, you are expressing your passion through your voice and your body, putting every ounce of your energy in service of what you want. Each chapter breaks down one mantra to use to focus on a key step to achieving your best self, including unearthing your desires, releasing resistance, and taking inspired action. Alongside each mantra, Stutland provides stories from her own life and those of her clients, a meditation or visualization, a journaling exercise, and an easy movement to accompany the mantra to help enhance its resonant power. And to put it all together, you are provided with a 14-day plan so you can design the life you want, infusing the power of movement, mantra, and self-reflection.